Education reforms that attempt to enforce fixed standards, continuous data collection and high-stakes testing are applying an industrial model of factory production developed in the early part of the last century. It’s a manufacturing approach that should not be applied to children. The factory model was developed over a hundred years ago, to ensure quality control and produce identical “consumer” products cheaply. It is NOT appropriate to use these methods with children, because their bodies and brains are designed to learn in self-directed ways that can be sabotaged by adult attempts to manipulate, measure and control them. 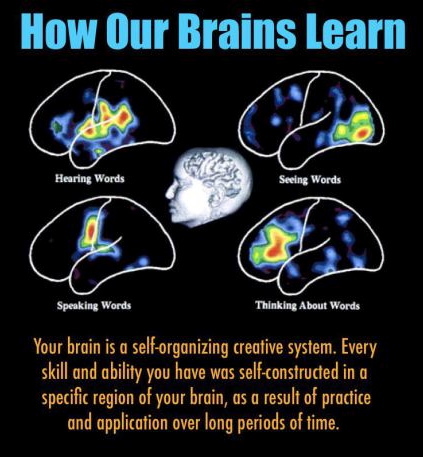 Learning is a creative self-directed process. Modern researchers and professional educators have come to understand that the human brain is wired for learning, and that the most effective methods of education must are aligned with how children naturally learn. In the business world the early 20th century industrial organization models of Scientific Management (aka, Taylorism) & Max Weber’s Bureaucratic Model have been updated and re-branded, but can still be recognized by authoritarian social hierarchies that emphasize top-down controls, strict standards, chains of command, rules enforcement, and data collection. 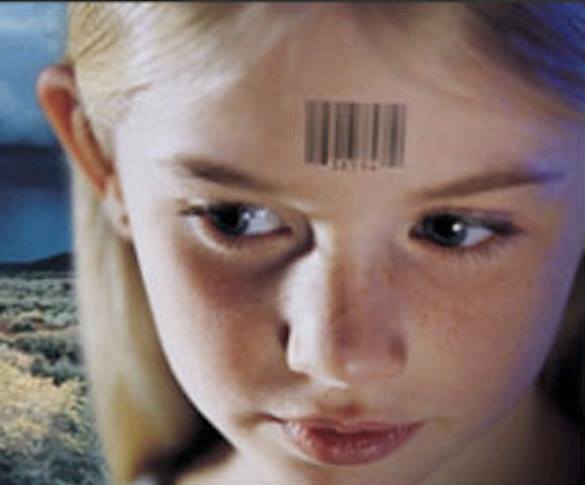 This system provides a highly effective way of making products cheaply and generating profits (turning everything the organization touches into a commodity to be bought, sold and traded), but is completely inappropriate in educational settings, and with children, because it ignores their inner lives, treating them like data points and soul-less products on an assembly line. 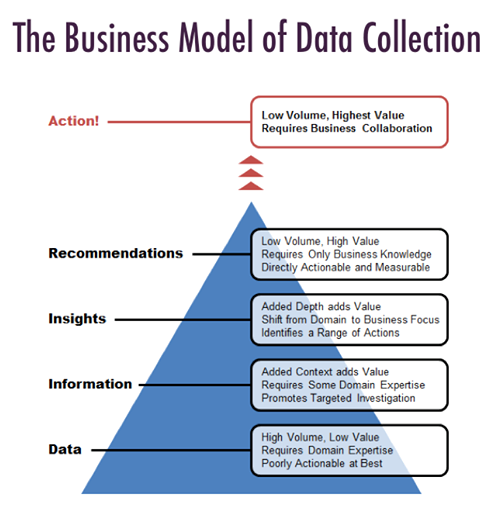 This graph shows the “business model” of data collection and decision-making that is utilized by many Fortune 500 corporations and is currently being implemented by education reformers in the United States. (It’s also quite popular in Asia, where it appears to be linked to higher suicide rates among young people in nations like China, India, South Korea & Japan). Notice that the data collectors (in the case of schools, this is teachers) are seen as being at the bottom of the pyramid. They need “domain knowledge.” But like factory workers, their job is to do as told, make sure top management’s “standards” are met and collect data (about how closely each child meets the standards). It is not their role to be creative, deviate in any way, be concerned about “developmental appropriateness” or make decisions autonomously. The children they instruct and collect data from are to all be treated alike, with standardized expectations and frequent testing. As we move higher up the decision-making ladder the managers (principals, superintendents) are expected to develop insights and make recommendations. But they don’t need to have domain expertise. What they require is “only business knowledge”! Management’s responsibility is to watch over the workers (teachers), to assess if their products (work output) is high quality or faulty. In other words, teachers must be held accountable for their production work. Like students, they are to be constantly assessed, so that those who don’t meet management’s standards can be punished, shamed or terminated. This system is extremely authoritarian, with all important decisions being made by those at the top. It is the leaders who develop standards, make policy, work collaboratively in groups (with their equals), having no contact with (or interest in communicating with) those at the bottom of the pyramid. From the point of view of many teachers and students forced to participate in factory model schooling it’s a soul-crushing system, where creativity, divergence and innovation are suppressed, and compliance rewarded. Where children are treated like commodities, and the research, warnings, whistle blowers and voices of dissent of those on the “factory floor” are ignored. Many of us grew up with this model of eduction, it’s what young people in the sixties rebelled against, what the music of Pink Floyd and other rock bands criticized. For some reason this mechanistic approach has been brought back and re-booted, stronger and more toxic than ever. Moreover, while there are laws in U.S. factories protecting workers’ rights there are no such laws protecting children’s human rights in schools. While it sounds like the problem is with business thinking, it’s not. Not all management people think this way. There are also innovative “people-centered” ideas in business, that pay much closer attention to human beings’ social and emotional lives and would be much more appropriate in educational settings. “As someone with an understanding of what current companies consider “good” business practice, I’m going to let you in on a little secret. The “business-based” assumptions and strategies being used to justify much of contemporary education reform are as outdated as the Model T..
First, following standard operations practice, we must establish whether education reformers see education as a service or a product. (As an educator, every bone in my teacher body screams service to all humanity with a damn it thrown in for good measure). Conversely, good product manufacturing requires heavy standardization, a reliance on quantification, and cost-efficiency above all. As we are all too aware by now, Education Reform, Inc. has a hearty appetite for big tests, education-in-a-can and MOOC hyping along with little if any autonomy for teachers. I agree with Ms. Altman’s assessment. Many current education “reformers” come with a business mindset, but are misapplying the factory production model. Even if they are not educators, they should know better! The data driven approach is meant to produce products cheaply and to enforce standardization. When a Nation’s Children are Being Treated like Commodities, Who Should Be Held Accountable? When 21st century education leaders ignore decades of research on how humans learn and the toxic “side effects” of high-stakes standardized testing (especially when forced on young children’s minds) it is an act of gross negligence and/or incompetence, a form of educational malpractice, in my opinion. People in charge of implementing a nation’s educational policies must be up to date on the research in the field. They need to be aware of innovative models of education which have successfully transcended the factory model of schooling. 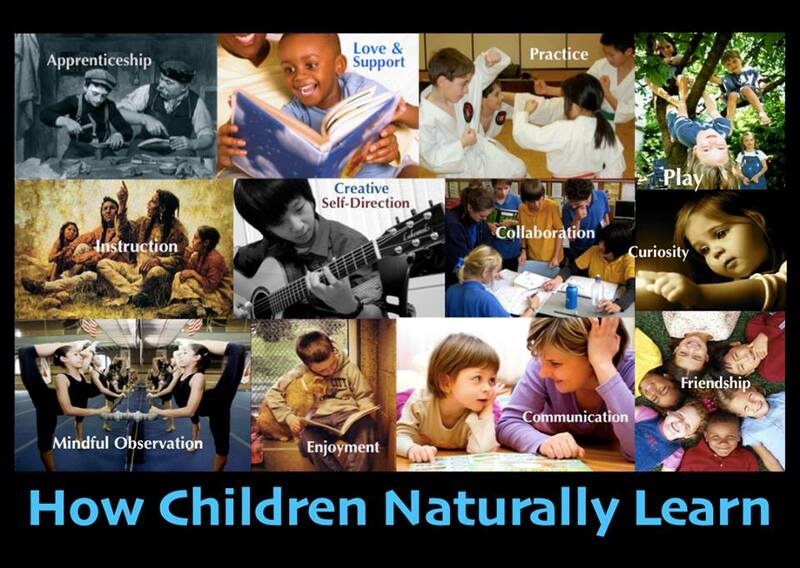 These new models already exist now, such as the Escuela Nuevo (New Schools) approach of democratic education, Deborah Meier​’s Mission Hill, James Comer’s School Development Program at Yale, Montessori schools, Circle of Courage (Native American model) and the Reggio Emilia approach. These innovative models are aligned with how children naturally learn, viewing schools as communities of learners, not as businesses with education managers and CEOs. The bottom line then is this: Those who speak of holding students and teachers “accountable” and emphasize data collection as “the solution” to education reform are applying outdated business and education models developed over a century ago. Children, teachers and parents everywhere should refuse to participate in this, and it is those at the top of this pyramid scheme who need to be held accountable! As many parents and educators have tried to make known (See: Fraud at the Heart of Current Education Reform), some of the powerful people directly involved with these factory model re-boots (dressed up as “innovative” reforms) appear to have a hidden agenda, attempting to sabotage public education and financially profit from children and schools. To expose their agenda we need the help of innovative business people, journalists and legal representatives willing to think deeply and look more closely at what has been happening. Every child is a unique and creative learner, born with unknown potential, who will grow and develop skills naturally when loved, respected and supported. As we enter into this new century it’s time to leave behind schooling models that place chains around students’ necks. We need to demand that our children’s’ natural rights be legally protected, so that their generation is free to learn. This entry was posted in education reform, Learner-centered education and tagged accelerated schools project, christopher chase, education reform. Bookmark the permalink. 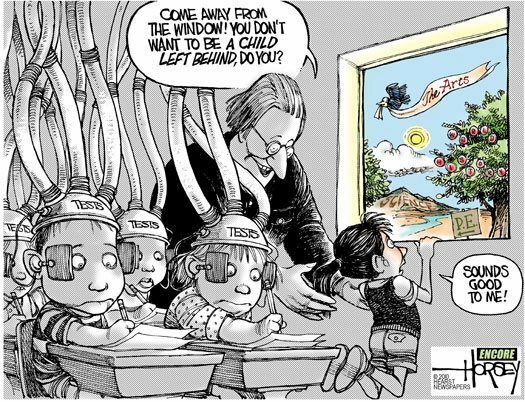 My only problem is with the cartoon — I think an old lady teacher is more likely to be looking out of the window with the kid, anyway, that was my experience at the end. Many of the young teachers I knew and worked with had been trained to do what NCLB wanted them to do. It’s us oldsters that couldn’t cut the mustard or fit the mold or whatever any more. LOTS of early retirement… There’s nothing “modern” about the discovery that kids are wired to learn or that arts are important. All of us codgers went to schools that had art and music as part of the curriculum and at least an hour of recess (outside on the playground or in the gym if the weather were bad) every day. NCLB is only 14 or so years old… But it means that someone graduating with an ed degree at the bachelor level today probably went to school under it at least part of the time. Absolutely — I always liked Dewey’s statement about meeting each (each!) student at his/her point of need and bringing them to the place they need to be at the end of the term/semester/program. And Godnose, Dewey’s been dead a while! I have two suspicions: There is a lot of intellectual confusion here; and I may not be smart enough to sort it out. First of all, there is nothing wrong with testing. Schools have always had testing. Some have weekly testing and even pop quizzes on any given day. The teacher needs this feedback. The students need this feedback. In fact the test is just a different way of teaching things. It forces students to focus on what they know and don’t know. My impression is that arguments about testing are used to camouflage what’s wrong at a deeper level. Second, you can teach total nonsense in the school and test it or not test it. There is no correlation. What we have in our schools now is mostly nonsense. Making sure the nonsense stays there is the big goal of our Educational Establishment, it seems to me. So they are constantly trying to hide what’s really going on and if they can get you talking about budgets, testing, irresponsible parents et al, they can keep you from paying attention to the real decay. Kids aren’t learning to read. They aren’t learning to do basic arithmetic. They are not learning basic knowledge. That is what everyone should be talking about and complaining about. Third, all this talk about factory schools seems to me another red herring. Ken Robinson has popularized this time and I don’t trust him at all. He seems to mean any school that is ingenious enough to make children learn a lot of stuff. I want children to learn a lot of stuff. Every school I’ve ever been to was a factory school, if you want to push that point. It was not a bunch of kids rolling around in the grass, which is the un-schooling ideal. No, if YOU want to learn programming, or Chinese, or the history of the Turkish Empire, you will have to study. As an adult you know that! So why do you think a bunch of nine-year-olds are suddenly going to be learning everything by some new gimmick. QED: what matters is the true intentions of the people at the top. If their ambitions are academic, then we will see it happen. If their ambitions are social engineering, which is what we are stuck with mostly, then you will see that happen. This discussion, so far as I can understand it, conflates many different patterns, to the point where we can’t sort out what is important. Here’s what I think is important. Let’s say a kid is in the sixth grade. He should know all the basic stuff: read and write English; add, subtract and multiply; point to Japan on a map; and explain which goes around which– the sun or the Earth. if those things are not happening, and generally they are not in American K-12, then you have a colossal failure. I believe that failure is dictated by the people at the very top, our far-left Education Establishment. The betrayal is not revealed by various weird forms of testing. The betrayal is revealed by our steady march toward mediocrity. None of which is to say that education shouldn’t be fun, entertaining, exciting. It should be. But it is fun with a purpose, a goal. Giving kids tests all the time does not mean they really understand something, even if they score well. A woman gave an example elsewhere how she understood the utility of mathematics by building a chicken house. I never built anything in school or used math to build things or measure stuff in the real world in that way. I studied Spanish for 5 years and never had an informal conversation with a person who spoke Spanish. I took lots of tests but still have never applied the language, and forgot most everything I learned. My sons grew up in Japan but also speak English well cause they applied the language, used it for real activities and communication as they grew. 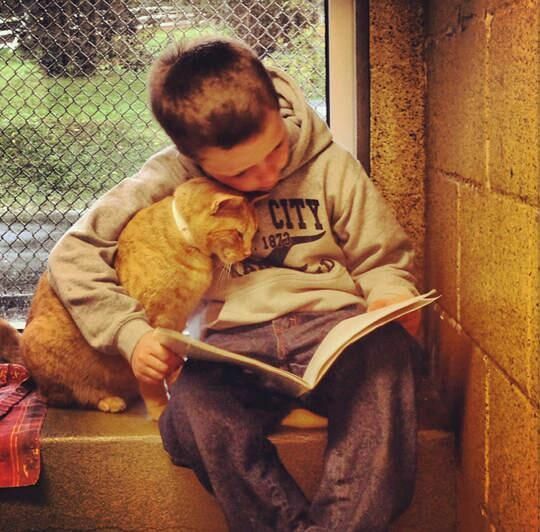 There were no tests, no pop quizes, just endless opportunities to enjoy using the language. This is how real skills develop. Their friends studied it in school and like my experience with Spanish, took lots of tests but never developed practical skills. So they cannot use it. This is the learner-centered paradigm, having students apply knowledge so that competence develops, the ability to use something. If that is happening they actually will remember better and do well on tests, but without the application of knowledge in meaningful ways the focus becomes tests and grades. Think about your own experiences growing up. What are you best at? What did you study and do okay in school with but cannot remember or use well? Chances are things you are highly skilled at you practiced and applied. That’s what the research tells us, and it supports the Mission Hill approach, not the one that’s dominated in China and that the powers that be are trying to re-boot here. Just for fun I wanted to share some links with you – but mainly the last one which says the Factory Model is bogus. I read it but would like to know what you think. Audrey Waters seems to think that it’s a straw man. Thank you Christopher – your blog turned up in several places today on Facebook. THE INVENTED HISTORY OF ‘THE FACTORY MODEL OF EDUCATION” – THIS IS A CRITIQUE OF ARNE DUNCAN AND THE DEFORMERS. http://hackeducation.com/2015/04/25/factory-model/ by AUDREY WATERS APRIL 25, 2015 — “One of the most common ways to criticize our current system of education is to suggest that it’s based on a “factory model.” An alternative condemnation: “industrial era.” The implication is the same: schools are woefully outmoded.” THIS IS ALSO A CRITIQUE OF THE KHAN ACADEMY – AND THEIR INVENTED HISTORY OF THE FACTORY MODEL. IT’S JUST NOT TRUE SAYS AUDREY WATERS. Hi Joan!! Yeah, Valerie Strauss shared something in this line recently. I just disagree. The whole thing is tied in with the industrial manufacturing approach. Seems as clear to day to me.